THE brass band, with musicians clad in immaculate khaki apparels, abruptly cuts its otherwise captivating tune. In unison, band members place their trumpets by the right side of their legs and stand in military-like fashion. Some band members are beaming youths, but they are masters of their art. For a good hour, which swept by almost unnoticed, the band switched from hymn to hymn as church members took turns in doing minute-long energetic dance displays. It is 9pm and the villagers are gathered at the tabernacle, a grass-thatched auditorium, where women in church uniforms sit on one side, the men on the other. The brass band would occasionally go in the centre, next to a vacant table with a clean microphone, to showcase their dancing skills. It takes an observant individual to notice how the band leads the sermon and that different brass tunes precede segments of the Nehemiah Mutendi-led Zion Christian Church (ZCC). Government officials, a busload of them, have all left. The officials led by Midlands Provincial Affairs minister Larry Mavhima, were here for a guided tour of Defe, a ZCC shrine 100 km west of Gokwe Centre. Mutendi, who is 80 years old and is full of energy, led the officials through the tour, showing them his numerous planned and on-going projects set to change the outlook of this semi-dry area. In jovial mood, the villagers hosted the officials who must have been relieved to leave their urban set-ups engulfed in fuel protests by angry town dwellers fighting authorities over a 150% increase in the prices of the precious liquid. Defe knows no strikes and for them it's work as usual. During the tour officials, government heads of ministries at provincial level and Gokwe district officials saw six dams, livestock, fields, a clinic, a proposed medical research centre, site for a planned tertiary and skills training college, a huge orchard and land reclamation sites. They also saw prayer sites, guest houses, a modern silo, "Defe's parliament" – a neat thatched place where traditional leaders sit to plan projects together. The officials were later treated to a sumptuous working lunch, coupled with summaries of what they saw and their recommendations.Most of these technocrats' reports were just verses of praise and nothing more. An animal expert, Divine Ndlukula, briefly lectured both the officials and staff at Defe on how to keep goats and other livestock,rounding up what perhaps was a very informative four-hour tour of a section of the area under Chief Mutendi. After giving the officials generous packs of cooking oil and rice, courtesy of Bishop Mutendi, the villagers went to refresh and gathered for prayers. Almost suddenly, everyone stands up. The bishop, immaculately dressed in a blue suit, walks to that vacant table in the centre where, before he sits, kneels with his face on the chair and says a silent prayer, maybe asking his God to come in and his flock follows suit. As soon as he sits, the brass band resumes and the villagers dance while he smiles from his chair and occasionally taps his foot. He is pensive, but jovial and smiles to a group of children who dance, imitating their parents. Despite his pensive appearance, the mood is very relaxed ahead of the night sermon and again, the band stops abruptly. Almost immediately, a pastor later identified only as Bhande, calls different villages to the front. He starts with Kibuttz village, whose name is borrowed from a collective community in Israel that was traditionally based on agriculture. "Those who have started projects, raise your hands," Bhande said and the villagers show the sign. Their task from the previous such church session, as later learnt, was to start self-employed projects at their homes, including keeping pigeons, fish and nutritious gardens. Bhande calls all the villages from Chamabhuru and Kalambo, where most of the 500 households under Chief Mutendi have initiated projects in Sayi 1A and Sayi 1B, all areas under Chief Mutendi. It dawns that Bhande had been laying ground for Mutendi's sermon, encouragingvillagers to do self help projects. "That is our theme for all this year until all people have projects. We are all encouraged to work," he said, quoting a verse where God gave humans power over animals. For the next hour, the leader of the ZCC that is fast spreading across the country, concentrates on how everyone must work for their food security and initiation of small income-generating projects at their homesteads. In a short sermon, he tells the villagers of his bigger vision to engage them in commercial irrigation agriculture using the dams toured by government officials earlier on. The ZCC has earth-moving equipment used in the construction of earth dams that will further be employed to open large tracts of irrigation fields as the church fosters agri-development in the otherwise semi-dry Zambezi River basin. "Our plan is to become productive. We will have a bigger breed of goats. We must also embark on cash crops and all year-round cropping. We are encouraged to work in the Bible and were given power over animals. This year, our theme will centre on projects, smallholder projects and we will stay on this theme for a long time this year," Mutendi said in between biblical verses as villagers listened attentively. "The officials you saw from government will help us achieve our goals. We have to initiate projects for ourselves because there is no employment, but if we are productive, we will employ ourselves on our own land," he told the villagers. "We are lucky to have been given a section of Chirisa Game Park. We will have goats for milk, sheep and cattle projects for God gave us power over animals," he preached in a calm and collected voice. His sermon was basically about work and in a calm and collected tone he urged his church members to shun laziness. 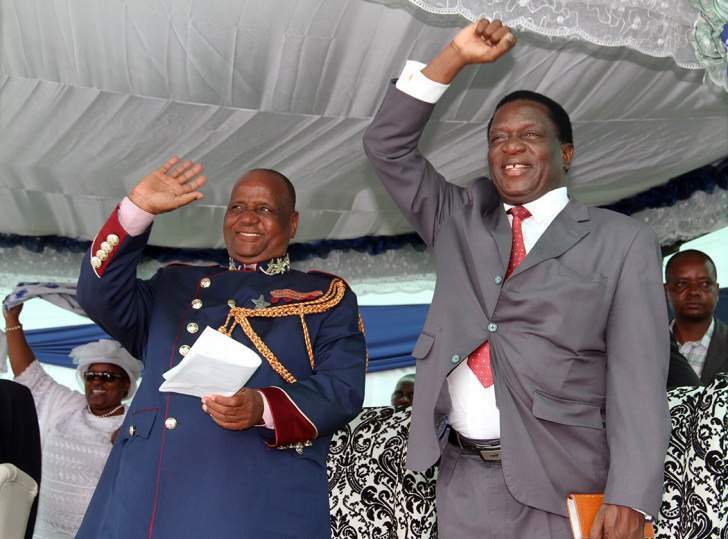 Far different from other churches that sell anointing oils, cast out demons and demand the congregants sow seed money that will grow, apart from charging fortunes to interpret dreams and sell blessed ballpoint pens to those sitting for examinations, Mutendi believes that people should work to be rewarded. "We must export our produce. To achieve that, we have to work and that is why I asked government officials to come here, share and help us realise our vision," he told his church. Villagers are set to benefit from a massive solar plant which is on the drawing board and that is expected help rely on power from the national grid. Mutendi hopes his Defe community will be the first in the Midlands to supply improved goats and be able to produce goat milk which health experts said is good for health even for children. Welcome to Defe, where miracles are received through hard work and not the touch of a hand coupled with the famous phrase: "I receive".